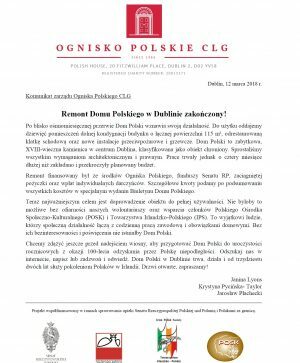 The Irish Polish Society is the first Polish organisation in Ireland with full EUWP membership (Europejska Unia Wspólnot Polonijnych – Union of Polish Communities in Europe). Events which the IPS have organised include lectures, concerts, art exhibitions, literary events, educational conferences, family days, debates, poetry readings, films, celebrations of both major Irish and Polish national holidays, social gatherings and other cultural, educational and traditional events. These have been well attended by our members, Polish Ambassadors, Irish Ministers of State, other dignitaries and the general public. 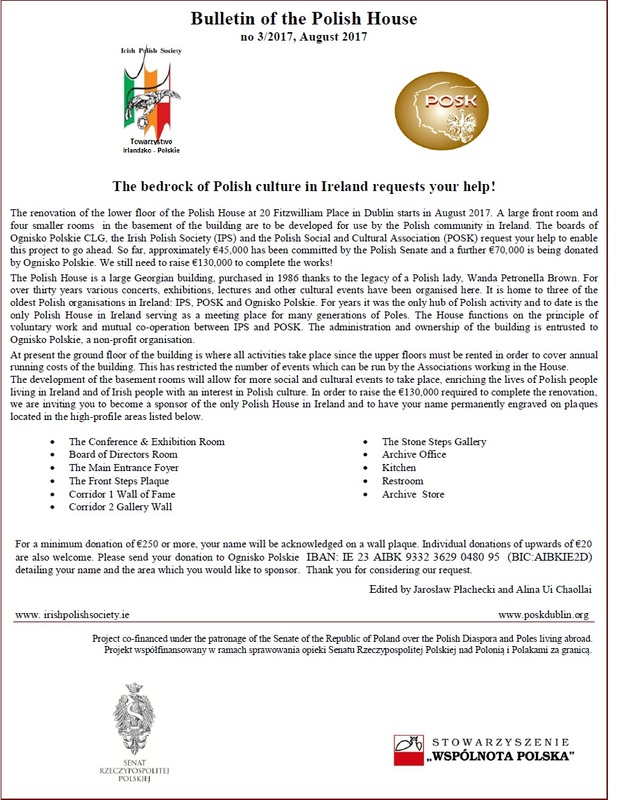 Membership is open to all who live on the island of Ireland and have an interest in Poland and Polish-Irish relations. 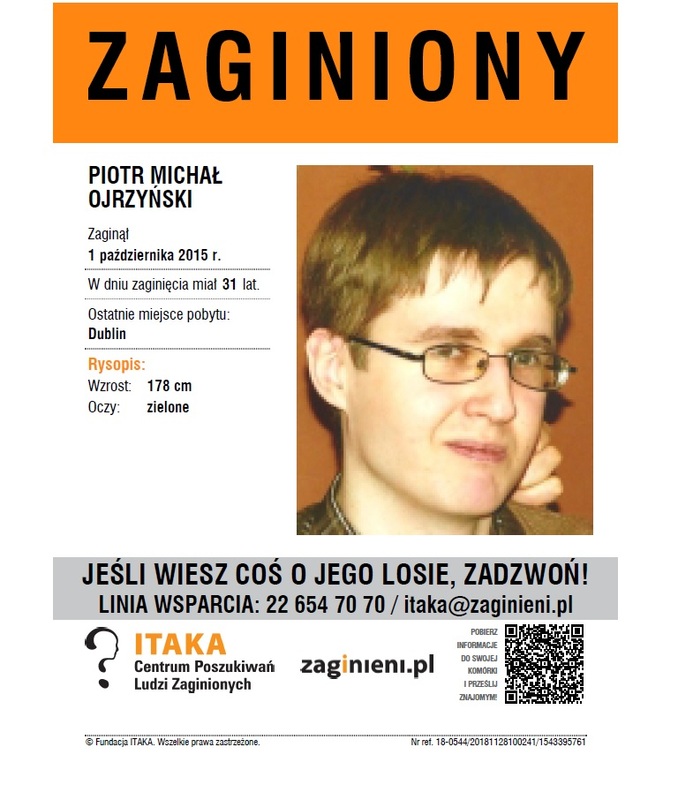 The IPS is gratefully sponsored by its members, Ognisko Polskie, Dublin City Council, the Polish Embassy, Ministry of Foreign Affairs of the Republic of Poland, specific and others. It is managed on a strictly voluntary basis by an elected committee of 12 people. The IPS Annual General Meeting (AGM) took place on Sunday, 14th October. There were some major changes in our Society’s management. The new IPS Committee is now as follows: Chairperson: Joanna Piechota; Vice-chair: Chris Wolny; Honorary Treasurer: Deirdre Holland; Honorary Secretary: Hanna Dowling (temporarily). Committee Members: Edyta Dolan, Marysia Harasimowicz, Jarosław Glowa, Jarosław Płachecki, Patrick Quigley, Jason Dolan, Kevin O’Neill and Krzysztof Kiedrowski . We thank those Members who already paid the IPS annual 2016/17 subscription. We ask all Members who have not paid yet to do this, please. 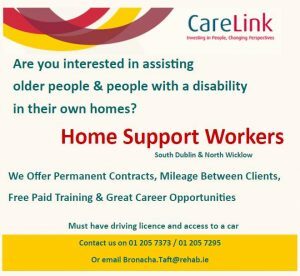 It is only € 12 per person annually, or € 17 per family. Students: € 10. Membership fee (cheques, postal orders) should be sent to our new Honorary Treasurer, Deirdre Holland. Address: 18 Allen Park Road, Stillorgan, Co Dublin. Irish Polish Society, Allied Irish Bank,100 Grafton Street, Dublin 2. Due to the voluntary nature of the organisation and the fact that the majority of the IPS committee have full time employment commitments, the committee is usually unavailable during normal working hours. The majority of our correspondence, meetings and events take place after 18:00 during weekdays or in the afternoon during weekends and public holidays. The roots of the Irish Polish Society go back to the election of Polish Cardinal as Pope John Paul II. On the initiative of Polish Jesuit, Fr Klaus Cieszynski, on 7th January 1979 the first steering committee of the Irish Polish Society was set up. The formal creation of the Society took place in connection with Pope John Paul II’s historical visit to Ireland (29th September-1st October 1979). 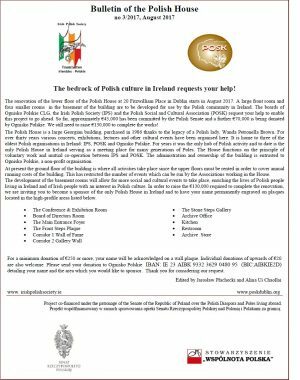 It is a non-profit and non-political organisation whose purpose is to promote friendship, mutual understanding and integration between the Polish and Irish communities through social and cultural activities. After the ‘birth’ of Solidarity movement in Poland (August 1980) the Society began actively lobbying for democratic changes in Poland. During Martial Law in Poland, imposed on 13th December 1981, the IPS organised substantial aid to Poland. 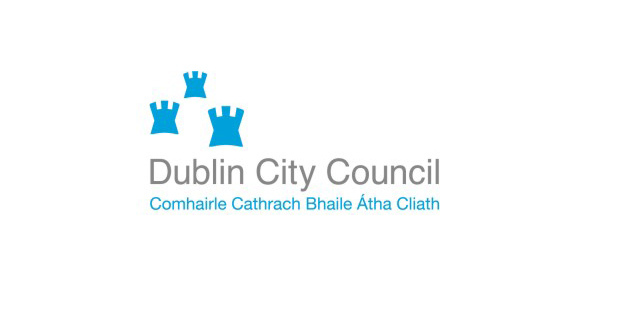 Some twenty containers of medical supplies, food, clothing were shipped from Dublin to Poland. For the first years the meetings and gatherings of Poles and their families and friends used to take place in Miltown College where the Society’s founder, Fr Klaus Cieszynski, was then a student. Thanks to a generous legacy from the estate of Wanda Petronella Brown, a Polish lady who married an Irishman, a large Georgian building at 20 Fitzwilliam Place, Dublin 2, was purchased in 1986. This became the home of the Irish Polish Society. 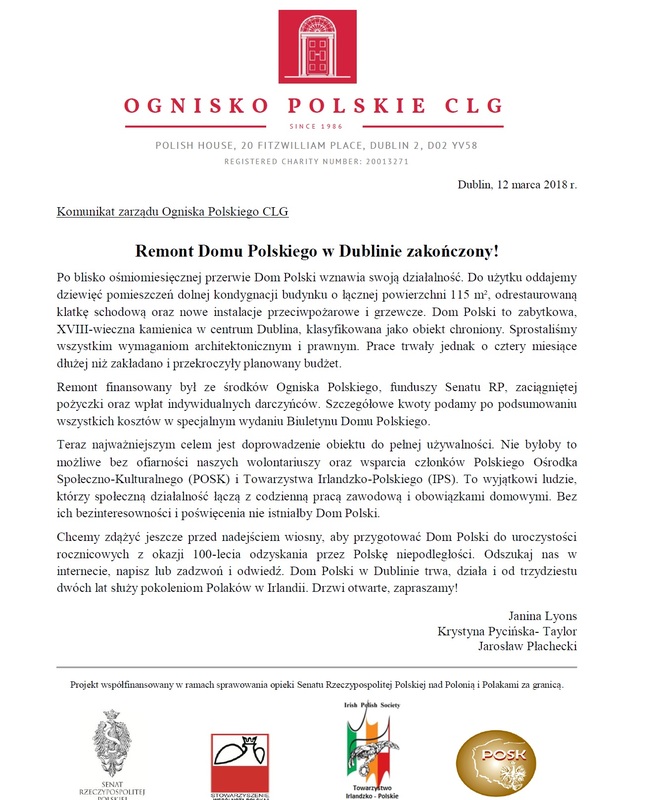 A new chapter in the development of Irish Polish relations began with the collapse of the Communist system in Poland, and in 1991 the Irish Polish Society established contacts with the newly opened Embassy of the Polish Republic in Ireland. In advance of EU enlargement we hosted several meetings and conferences with politicians and well-known public figures, both Irish and Polish. Our Society was committed to Poland’s accession to the EU. In 2004 the greatest shift in the relation between Ireland and Poland came with the opening of the Irish labour market to Polish workers. Since then the IPS have been focused on how we should respond to the new situation. We wish to increase our social and cultural activities to promote integration of the new Poles through events and information.